I am one that loves when the seasons change but I am always sad when summer comes to an end. I love summer, being outside, my flowers, the pool, grilling and all things summer. 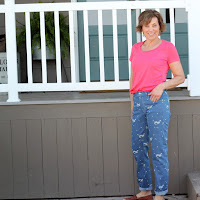 In this post, I have two garments, patterns from IndieSew and I have made them in blue fabric. I guess it is my mood, feeling blue that is Labor Day and summer is coming to an end. 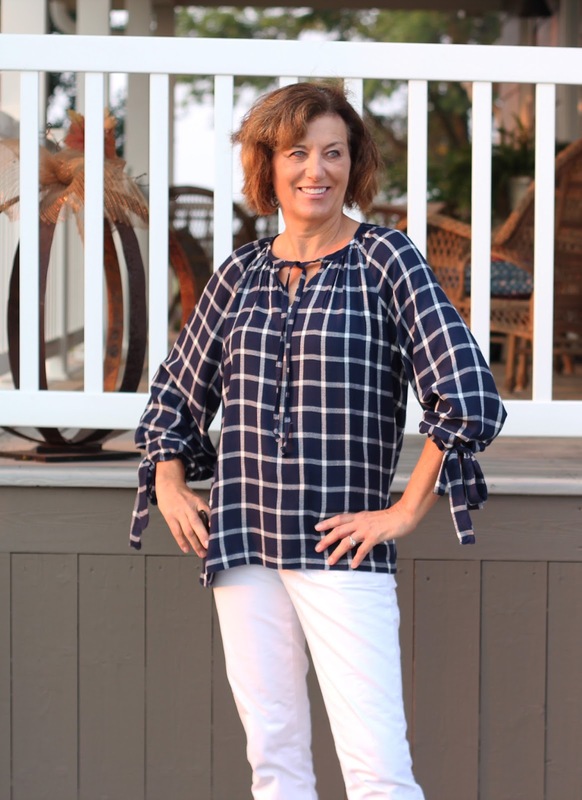 I made this up first in a solid color, it is pretty and I like the way it looks but with all the lines of this top, I wanted to do something else with the design. 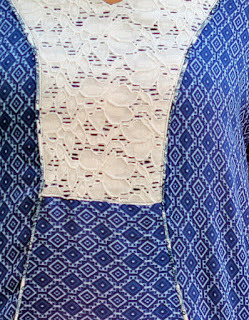 I took some stretch lace fabric for the yoke, added some piping and in total used three different fabrics to get the look. 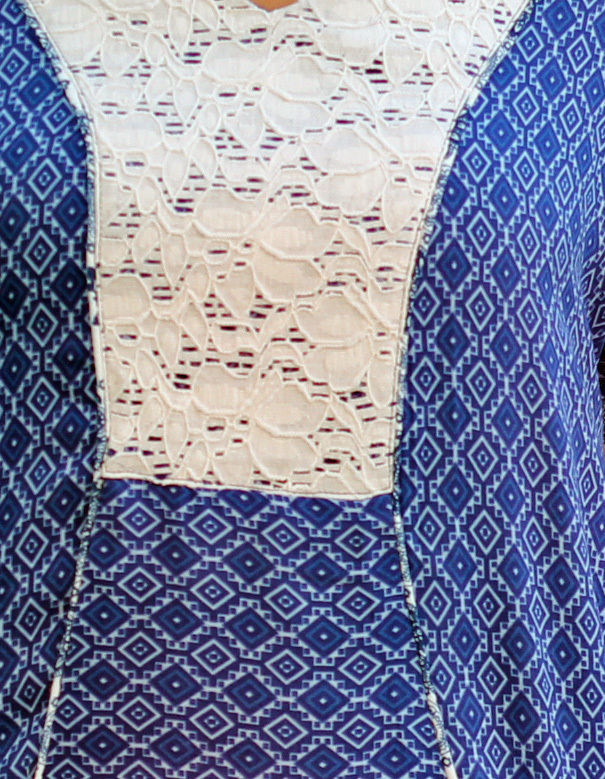 Here you can see the stretch lace, which I just basted on top of the navy diamond fabric and treated as one. Next up the piping, which is the same paisley fabric as the sleeve cuff. I only added the piping in the front. I also, ran the diamond fabric horizontally in the front panel. I wanted the visual interest and truthfully, didn't have enough fabric to match the design! Here is a photo of all the fabrics working together. 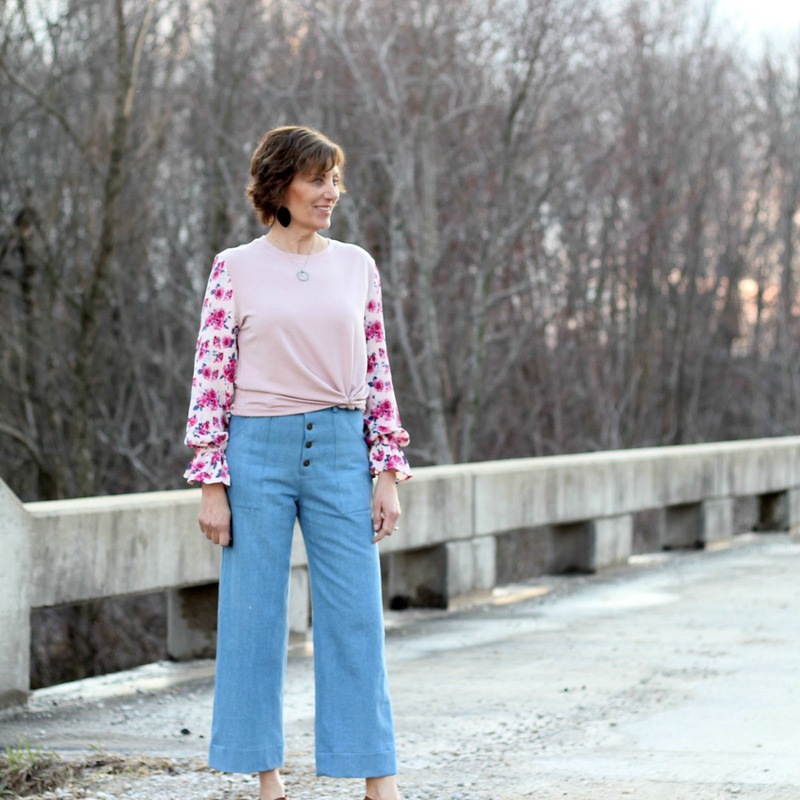 I think it is a fun look and I was hoping for boho chic. What do you think? 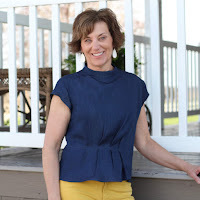 As I mentioned earlier, I made this top in a solid blue rayon and was planning on using the self-fabric tie. As much, as I love the idea of a tie, it just doesn't work for my body shape. It makes me feel awkward and with my more straight shape, the tie seems to add bulk to my middle. After making the first solid one, which is great, my mind just started racing with the ideas and that is how I came to this design. 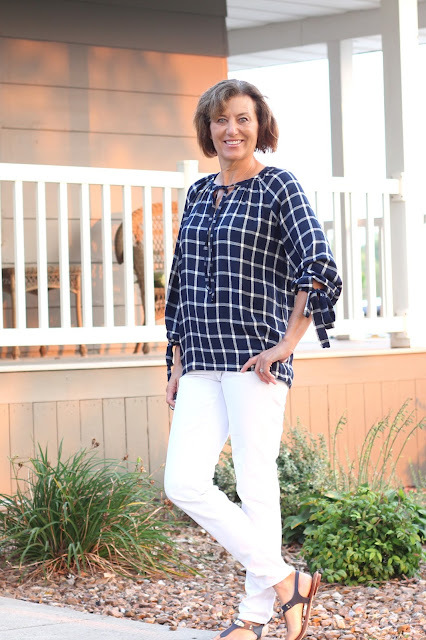 I think it all works together for a fun top, perfect to celebrate the end of summer and give something new to my wardrobe for the warmer September days. 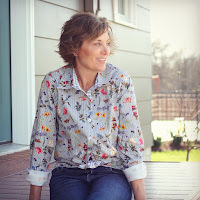 I really like the design, shape, style and instructions of this Sew House Seven pattern. 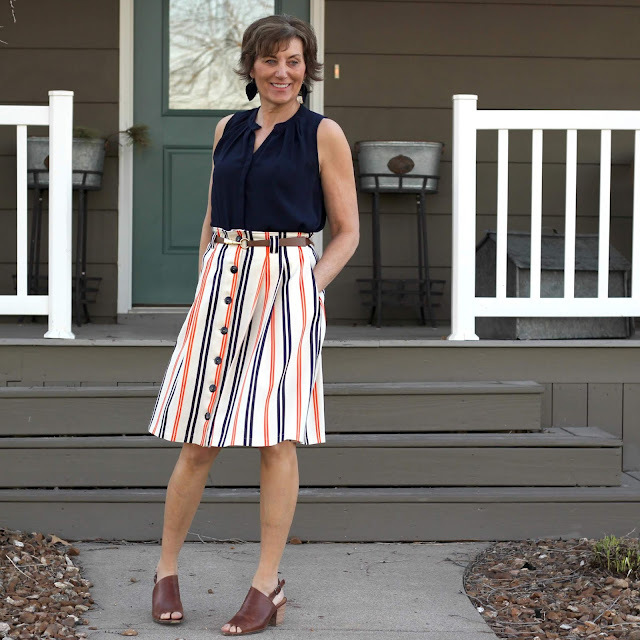 You can really make it your own and the pockets on the dress are incredible. Instructions are very thorough with great illustrations. 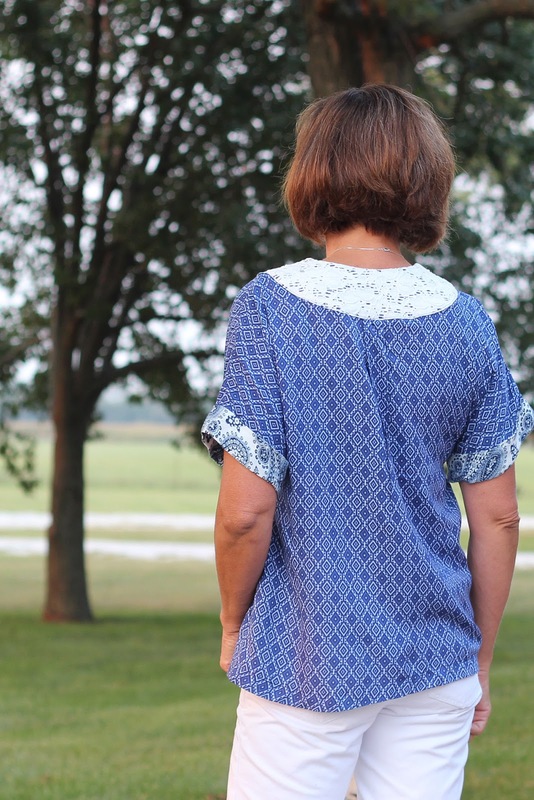 Here is the back of the top, the lace on the back yoke is a good detail to add interest to the back. 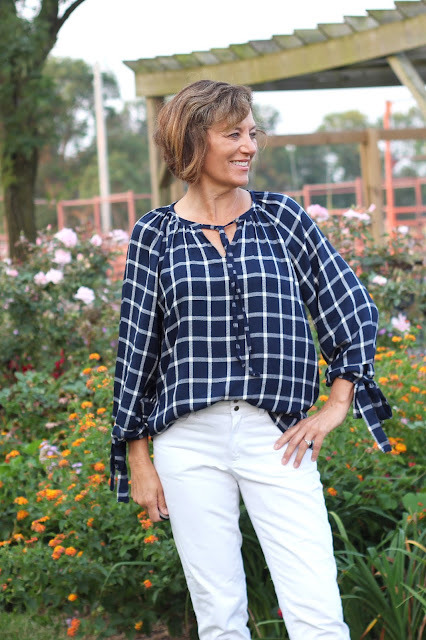 I had this idea from a WHBM top and decided I would try make it with my own twist, It is the year of the sleeve, right? My take was to add a casing to the bottom of the sleeve and leave it open at the center of the sleeve. Then I made some ties, inserted into casing and ta-do my own fancy sleeves. 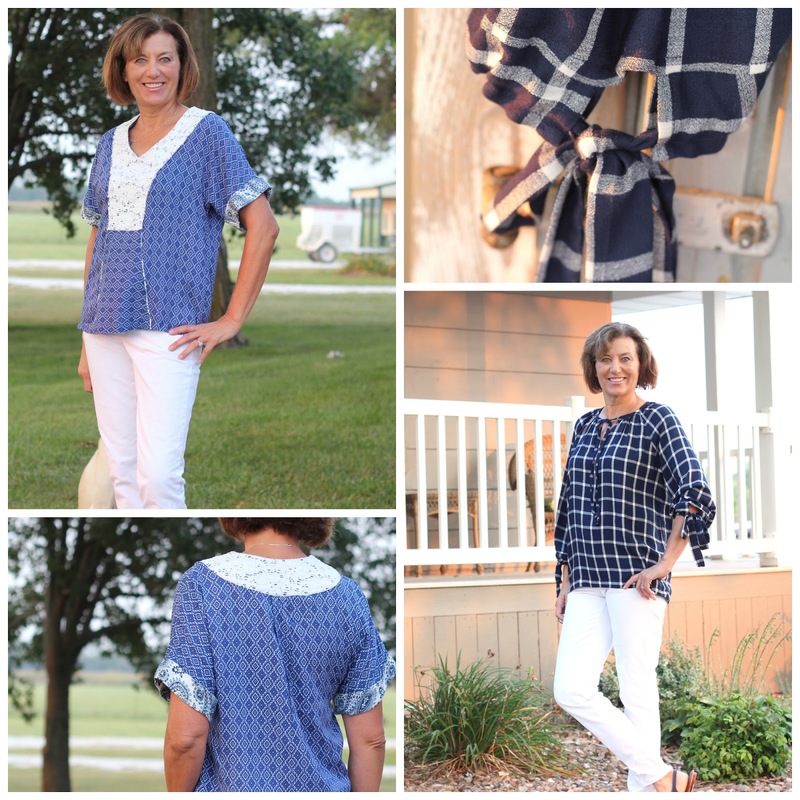 The construction of this blouse is so easy and the instructions are excellent. I have made it before and kept telling myself I needed another one. It was the perfect time to use this pattern. The only thing you need for the sleeve ties, is someone to help you tie them! 😁 One is tied perfectly and the other one, I could not get it to be right. Hubby was already gone, so I just had to deal with one of the ties slipping down my arm. I might be feeling a bit blue with end of summer and Labor Day but I am heading out to enjoy our warm day and take a swim. 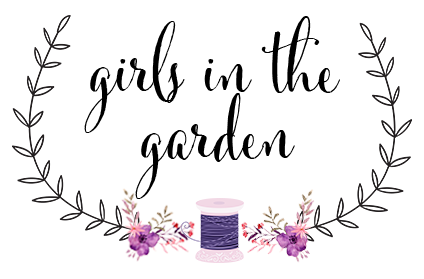 Disclosure - I was provided a pattern of my choice as a part of the Indiesew blogger team but the opinions are all mine. Both great jobs! 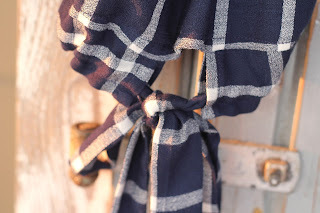 I especially like the Roscoe and the ties work perfect with it. Thank you so much, I will enjoy the roscoe for the fall days. 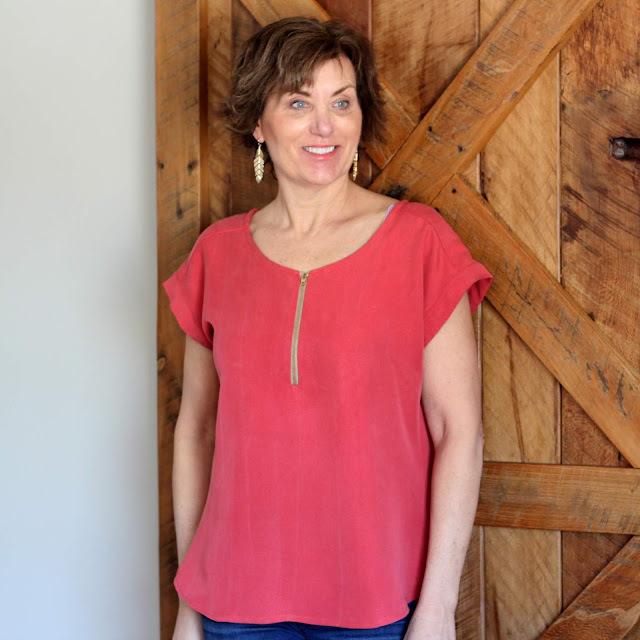 Love your Teahouse top. All those fabrics play so nicely together. Thanks, Catherine, it was so nice to pull out the fabrics and plan. 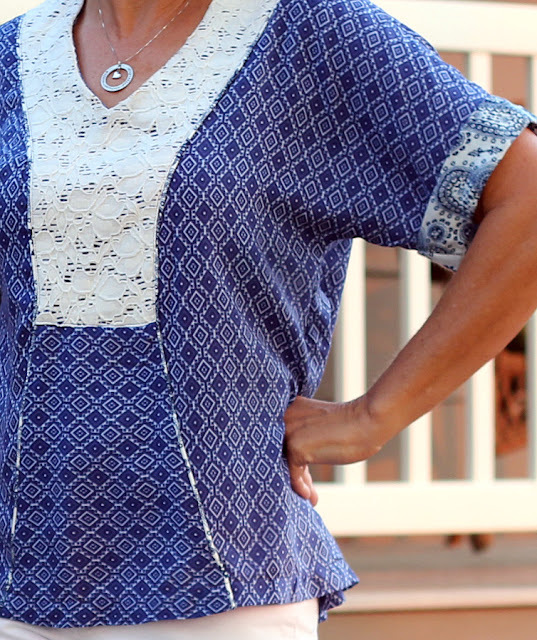 love the blues and yes the pattern matching is great!! Thanks, Beth, sometimes it really works out nicely. Lori, I love what you did with the Tea House Top - I would have never bought this pattern, but seeing your top changes everything! I feel the same about ties on tops and dresses - they just don't work on me, so I really like that you did not use them. 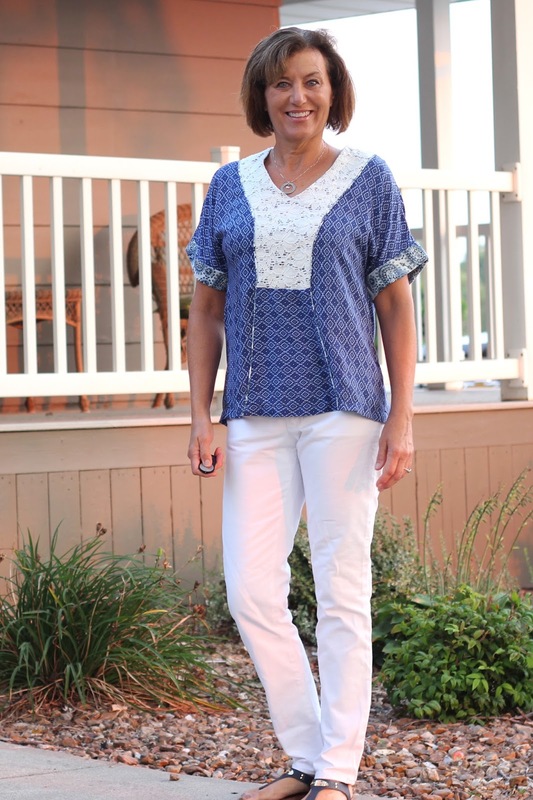 I love the three fabrics and especially the stretch lace. Thanks for some great inspiration and alternative ideas! Thanks, I bought it for the style and the belt. Then reality struck and I needed to do something different with it. I love what you did with the Tea House top. 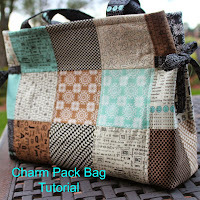 I have the pattern, but haven't been inspire to make it. 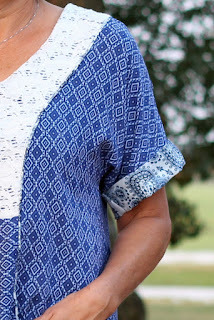 I love how you mixed the lace with the print and added the contrast piping. You really elevated it to a new level. Now, I have to try it! The other top is great too, one that's new to me. Great ideas! Thank you, they were both fun to make. On Labor Day, I spent an hour looking at your blog and all your beautiful garments. I was writing down pattern numbers, you are a great inspiration. Both are super pretty Lori. I wonder if you could tie the sleeve before putting it on...tight enough, but loose enough you could your hand through? Thanks, Sue and that is an idea, it might work. Love both of the tops! Yes, I feel like you do about summer. It has gone by so very fast. Thanks, Tomasa, maybe we should have a miss summer party together! 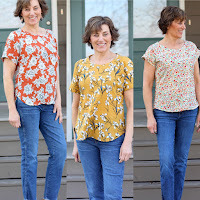 The first top works really well with the three fabrics...lovely! And yes, a little bit Boho. 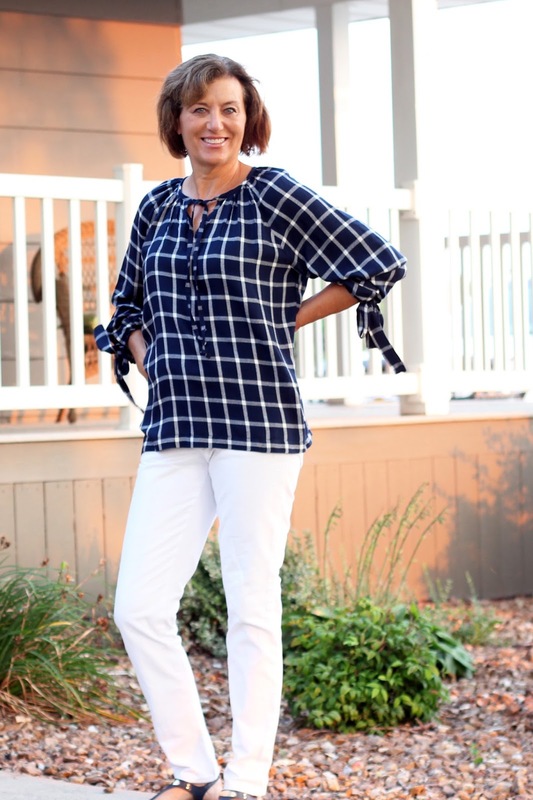 I adore the window pane rayon top too and I'm super impressed with the pattern matching which is spot on. Thanks, Diane, they were both fun to make. You don't look blue in your new tops, you look beautiful as does your garden. I think you have captured the boho chic look well , I really like that look too.